Headlines: Not a lot of change in the fishing over the last week but there have been some very positive reports. 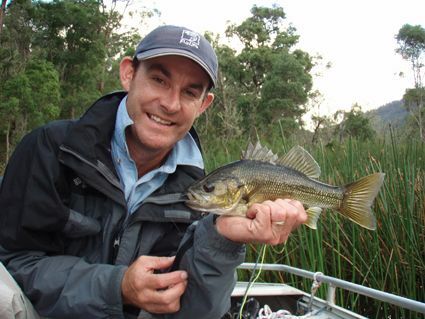 Rain and cool to cold days have produced some good fishing in the dams and rivers over the last week. Lake Eucumbene is still rising and the fish are responding well to all techniques. 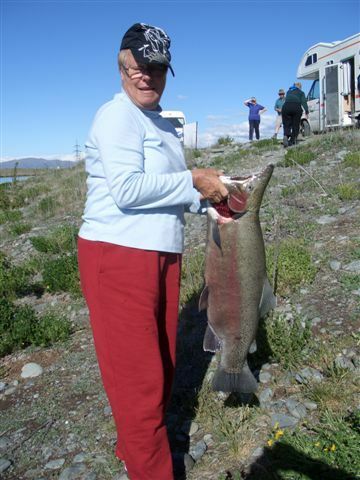 Rivers have good head of water and are fishing well too. Although not a locally caught fish, have a look at this amazing Rainbow from New Zealand, caught by Pam Berman from the Central Coast. The fish weighed 8kg! What a monster. 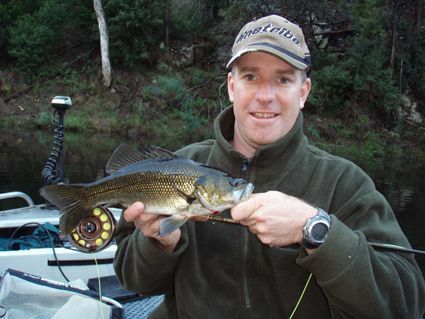 We had a good session at Brogo Dam on the weekend with eight of us travelling down from Cooma. We had a friendly Fly only competition going, with a 'Bragging rights' trophy included and between us we landed in excess of sixty Bass. Stuart won the right to brag landing twenty fish, his nearest rival was twelve behind so he did very well. I fished with Matto and we caught a few nice fish. Pics below. The hopper fishing should improve as the weather warms again. *Tom, fished the moonbah on the morning of 6th. for about 2hrs. before the wind got to be too much. Caught 5 rainbow & 1 brown all about half a pound or a little over. Dropped a few more before I realised my hook was not very sharp. There are a lot of fish around that size in the river and the water was flowing well but clean. Lake Eucumbene:- The lake has risen again this week and much of the Love Grass that was proving a pain has gone. The lake is looking fantastic at Buckenderra, Seven Gates, and Yens Bay with lush grassy bays. There is a heap of food in the water at present too with Damsels Nymphs, Corixa, Mudeyes, and Caddis being plentiful. Had a good report from the Buckenderra area on the weekend. Trolling from a kayak produced some nice fish in the middle of the day for one angler on an old Nilsmaster Invincible who reported losing a couple and seeing quite a few fish that were rising too. *Local John Pene had a great middle of the day session at Illawong Point, Anglers Reach. He caught six Rainbows from 37-43cm on Spider Mudeyes releasing one of these. The amazing thing is that this was on a bright, sunny day and the fish were on the chew between 12 and 3pm. All fish were in great condition and fought hard. One of the fish had 43 mudeyes in its stomach and another 37, the others did not have as much. Mudeyes are definately on the menu at present.